If you live in a bushfire-prone region of South Australia, roller shutters can prevent window glass from breaking, keep flying debris out of your home, and form an extra level of defence against both heat and flames in the case of a fire. Roller window shutters can provide a valuable line of defence against the dangers of fire. In extreme heat, windows will often crack or explode, while glass will fall out of its frame. This means that flying sparks and burning embers can come in through now-unprotected spaces. However, bushfire resistant shutters have been shown to withstand extreme radiant heat and so prevent the glass in windows and doors from breaking, providing a more robust barrier against encroaching fire. Aluminium window shutters also have a baked enamel paint finish and are injected with polyurethane foam so that they are resistant to flames and form an additional line of defence. 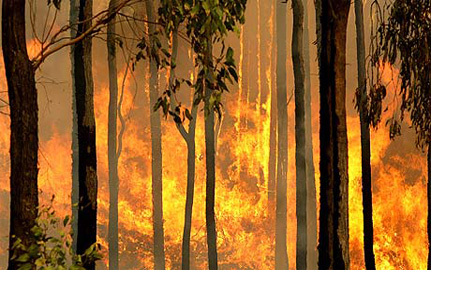 We produce a range of extruded aluminium roller window shutters that have been designed specifically for areas that are prone to bushfire risk. They have been tested by being subjected to a maximum radiant heat exposure of 40kw/m2 and after an hour’s rigorous testing, they showed so signs of ignition or flaming, and retained their integrity and remained operable. These shutters passed the CSIRO test at the level of BAL40 (Bushfire Attack Level 40), meaning that they are capable of withstanding a severe bushfire attack. Remote controlled shutters that operate on solar power are also extremely useful in bushfire-prone areas, because even if mains power is cut during a bushfire, the shutters can still be closed in order to protect your property from burning debris.